If you’d been considering a trip to the Middle East but aren’t sure about the region or where to go, look no further. With so many countries in some level of disarray, one country which has remained strong and safe is the gorgeous country of Jordan. Jordan is nestled between Israel, Iraq, Syria and Saudi Arabia but is arguably one of the most relaxed in the region as well as welcoming to visitors. Read ahead to learn more about this wonderful country and what you should do to maximise your time here. The city of Amman, the capital city of Jordan, is a bustling city that offers a few unique and interesting points of interest to visitors. While the streets are somewhat chaotic and pedestrians aren’t often catered to, using a system such as Google Maps will help you get around. There are not a huge amount of things to see and do in the city, and instead it’s a better place to base yourself to explore further afield. The few things in the city though arr interesting and would take you around two or three days to explore. Points like the Roman Amphitheatre and Roman era ruins such as the Temple of Hercules are impressive to see. The Ummayad Palace sits on a hill overlooking the city and makes for a great viewpoint. For those who like quirky streets and kitschy cafes, check out Rainbow Street, named for the former Rainbow cinema that used to operate nearby but has since fallen into disuse. There are also a few art galleries that feature artwork from both local and international artists. 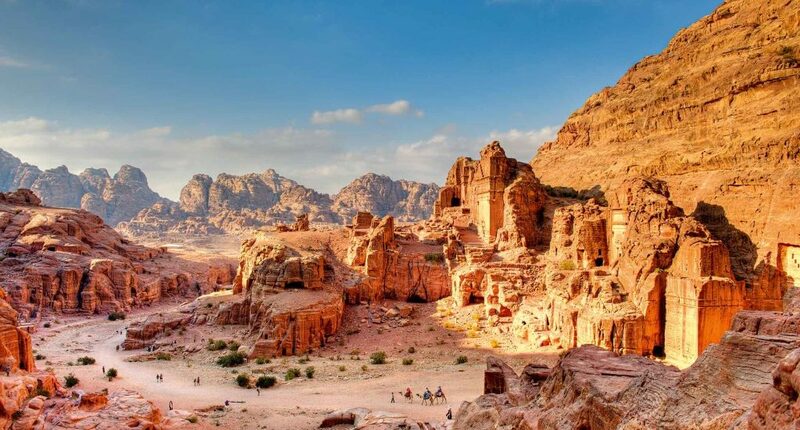 Set along the Desert Highway connected Aqaba and Amman, Wadi Rum is a spectacular desert region featuring towering red rock cliff faces and vast expanses of sand. Many compare it to the likes of Sedona in Arizona, with similar rock formations, but in a much greater number and in differing shapes and forms as well as full cliffs that can be hiked. The region is relatively inhospitable but is inhabited by several nomadic Bedoin tribes, so the only real buildings here are goat hair tents and a few shabbily constructed concrete shops and the fortress office of the Desert Patrol Police, so if you’re looking to get away from the build up of the city, this is the place for you. Getting here can be as difficult as you make it – buses run here from Amman, Aqaba and Petra, but you may get dropped off along the highway and have to wait for a mini bus or take your chances with hitch hiking, which is common and very safe in this part of the country, even for solo women, so try it out if you find yourself waiting on the highway. Talk to your hotel and work out in advance what the situation is – if they go all the way to Wadi Rum or if you will be dropped off a ways out and have to make your way to the village yourself. Arguably the most popular destination in Jordan is Petra and the Treasury, set back in the stone walls, the stone carving in the cliff side attracting thousands of visitors each year. The city dates back to 300 BC and was used as a stopping off point by traders due to the proximity of Petra from regional trading routes in the area. It was designated an UNESCO World Heritage Site in 1985. The city of Petra nearby is a delight to wander through, and if you’re interested in exploring outside the city, a guide can be arranged to take you on hikes through the desert cliffs and wilderness to experience real, rustic and rural Jordan. 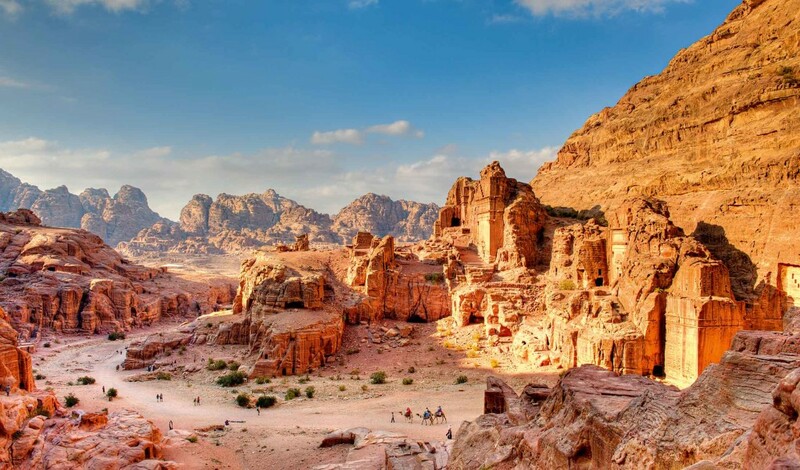 So there you have a quick rundown on the country of Jordan, a country that continues to remain stable amid turmoil in the Middle East and welcomes thousands of visitors every year with its open arms and warm hospitality. So get your bags packed, Jordan is waiting to welcome you.